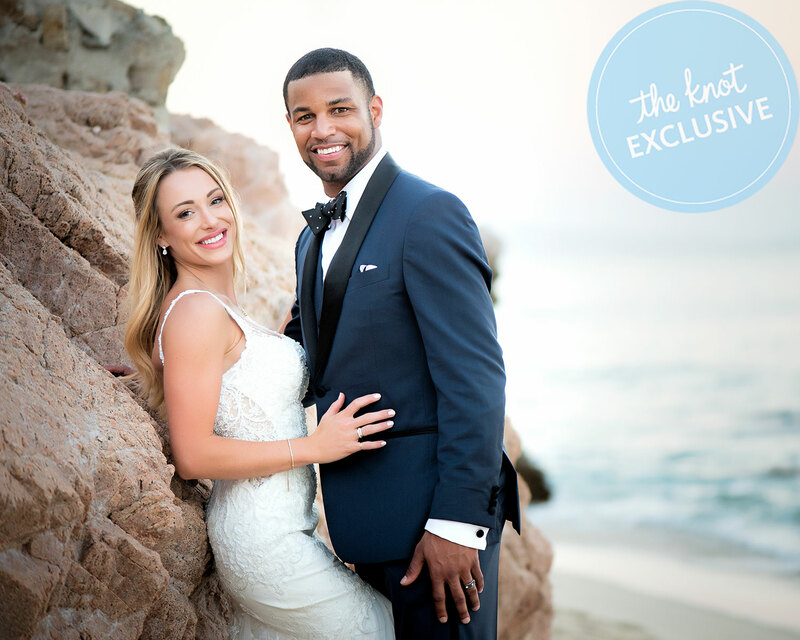 Super Bowl winner Golden Tate says marrying Elise Pollard was the ultimate touchdown. 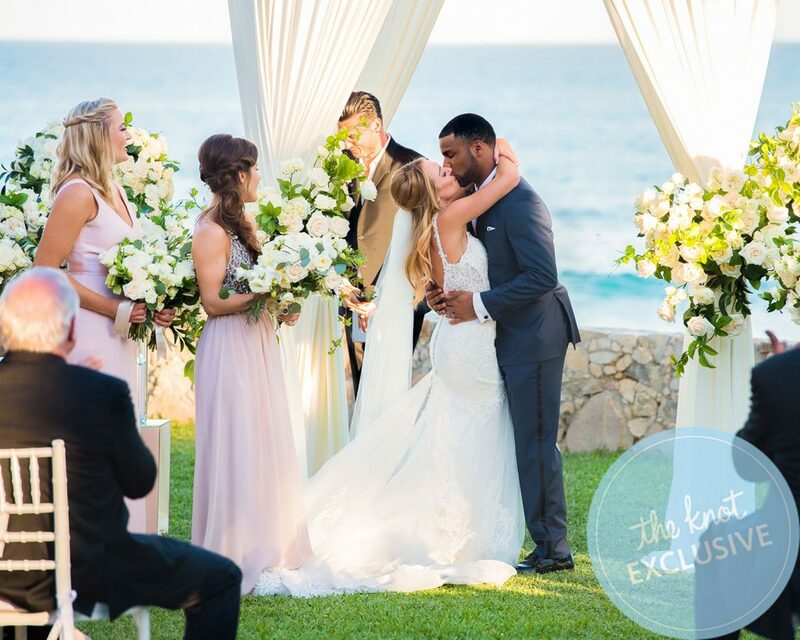 After a 15-month engagement, the couple finally exchanged vows before 250 guests in Cabo San Lucas, Mexico, on March 11. 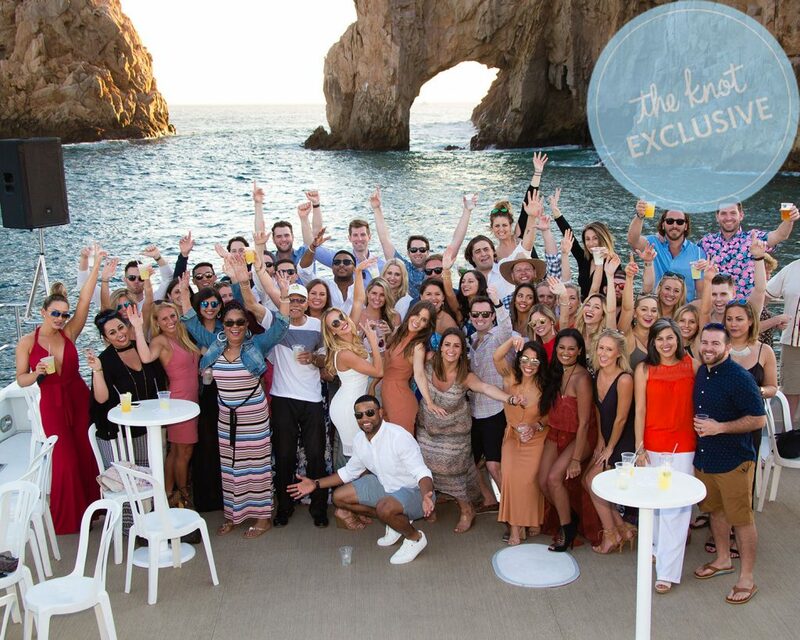 The celebration kicked off Thursday morning with a golf tournament for Tate’s groomsmen and pals, followed by a massive yacht party that night welcoming the 180 people who took off work and flew down early for the occasion. 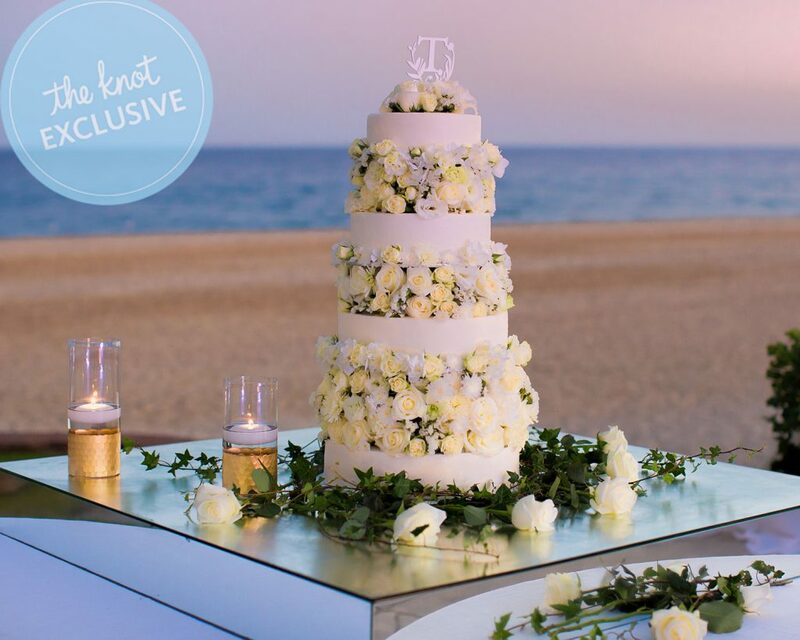 “Our guests literally booked their flights around this party,” the bride says. 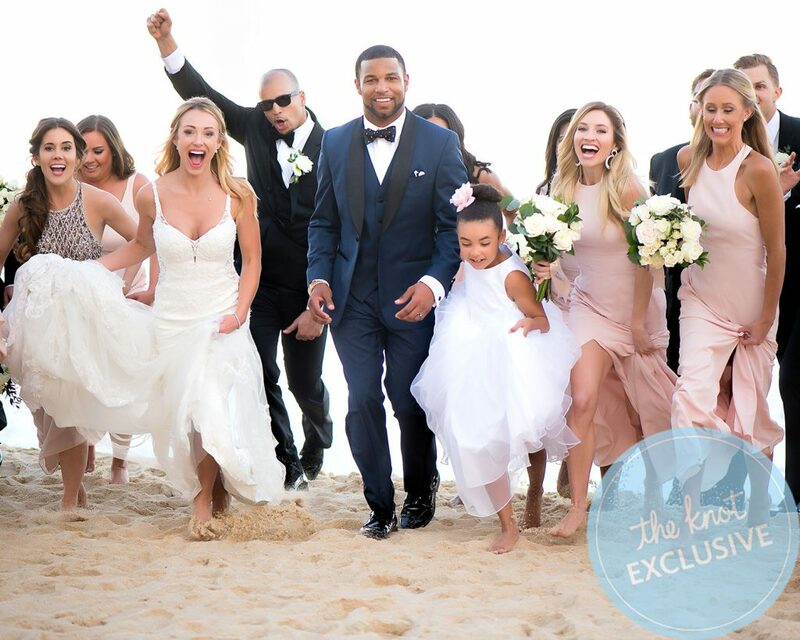 On Friday, the pair hosted a rehearsal brunch for their wedding party and family members, which was followed by a pool and beach party. There was an open bar and welcome lunch, and all types of games including customized Jenga, beer pong, beach volleyball, and more. One of the elements that was a huge hit during the wedding week was “Tate Trivia” (created by Jennifer Haddad for Vivian Elle), which tested guests about facts related to the couple. “We placed these all around the hotel, at the restaurants, at the yacht party, and more,” Pollard recalls. 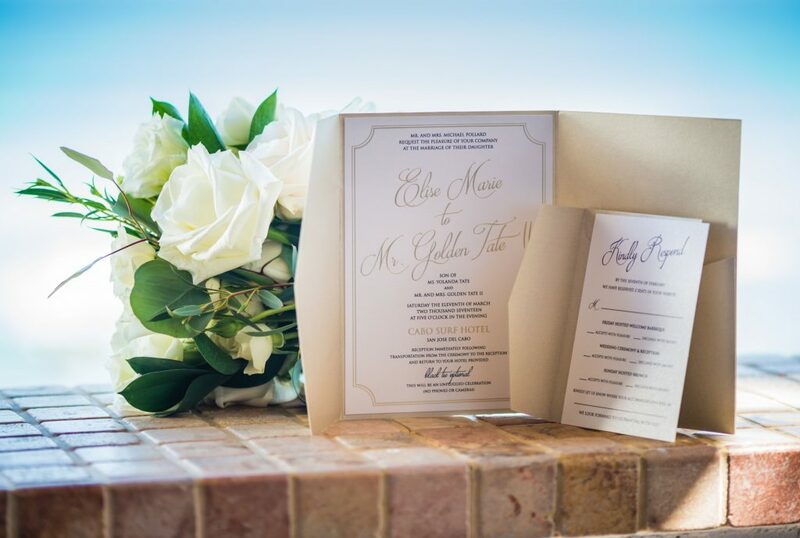 “It was such a fun and unique way of the bridal party to share special stories they had with the bride and groom.” Vivian Elle also designed the couple’s invitations. Saturday was the day of the wedding. “Our planners worked their butts off for six [separate wedding] events,” Pollard, 29, continues. 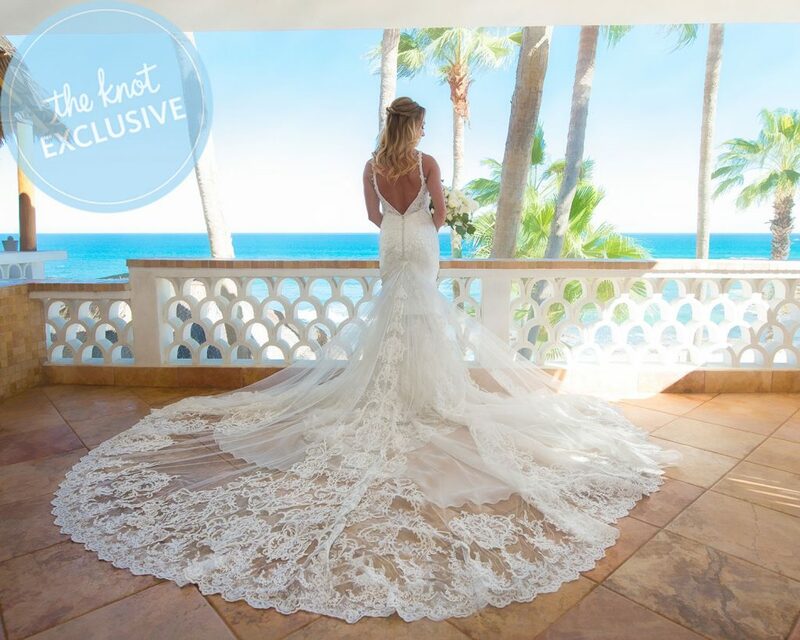 “Amy runs events in a way that make the guests’ jaws drop to the floor.” Abbott’s commitment to a smooth wedding week was especially evident when it came to basics necessities. 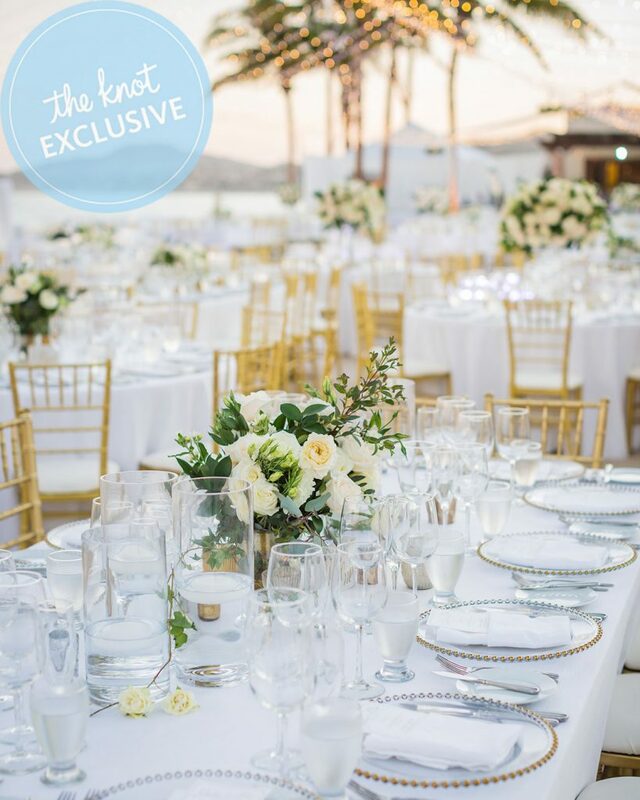 “She went to Costco six times for us,” the bride reveals. 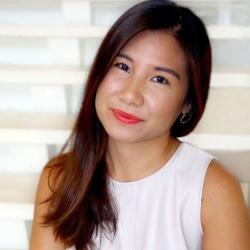 Hence why the bride wore her mother’s perfectly-preserved, 36-year-old wedding gown. Pollard had tailor Olga Szwed alter the gown and remove the original sleeves and train. The wardrobe stylist added a modest slit to reveal a sliver of leg, and removed the front pleats to convert the gown into two separate pieces. 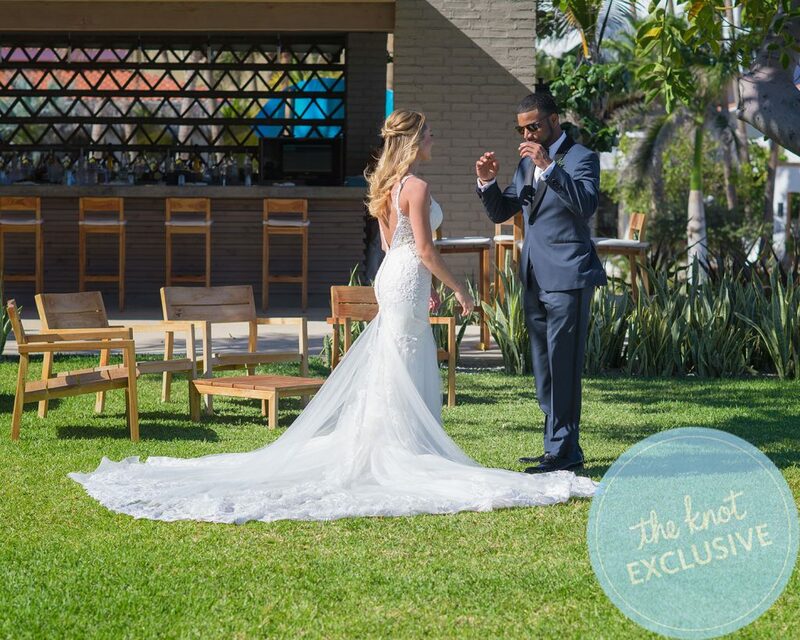 “It was so special to wear something that meaningful on our wedding week,” Pollard recalls. 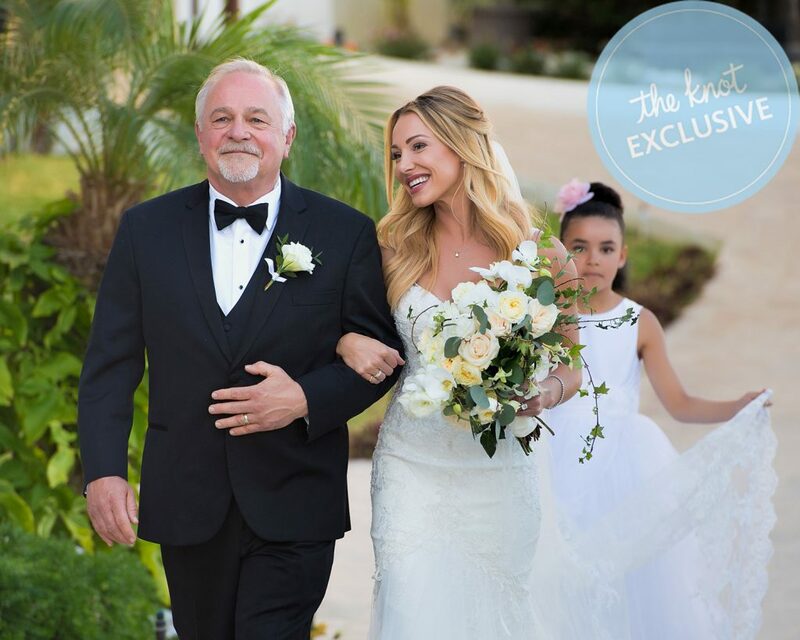 “The gown symbolized the 36 years of devotion, love and respect in the example we want our marriage to be like.” Her father, Mike Pollard, walked her down the aisle to an acoustic version of Beyonce’s “Halo” by Live Strings. 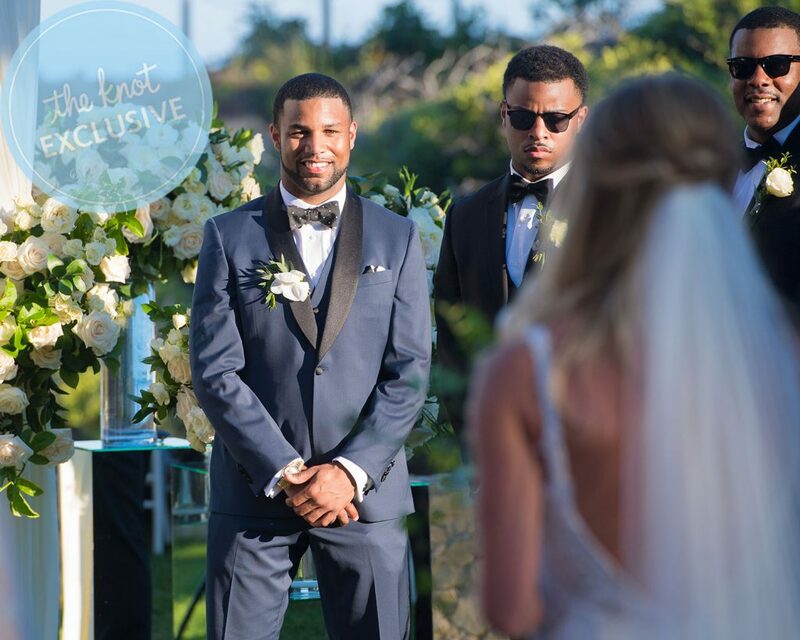 The groom was supported by 11 groomsmen, including Detroit Lions teammate Reggie Bush, Seattle Seahawks player Jermaine Kearse, and former Chicago Bears quarterback Jimmy Clausen. 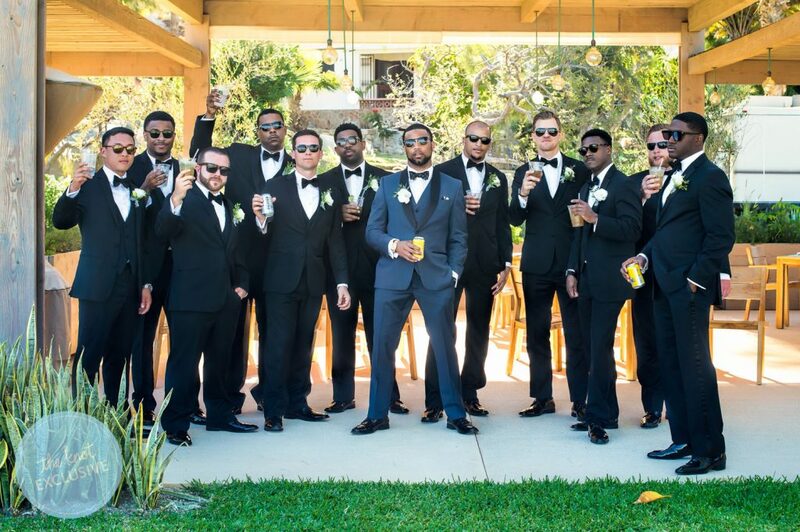 The party stood tall in classic black tuxedos by Jos. A. 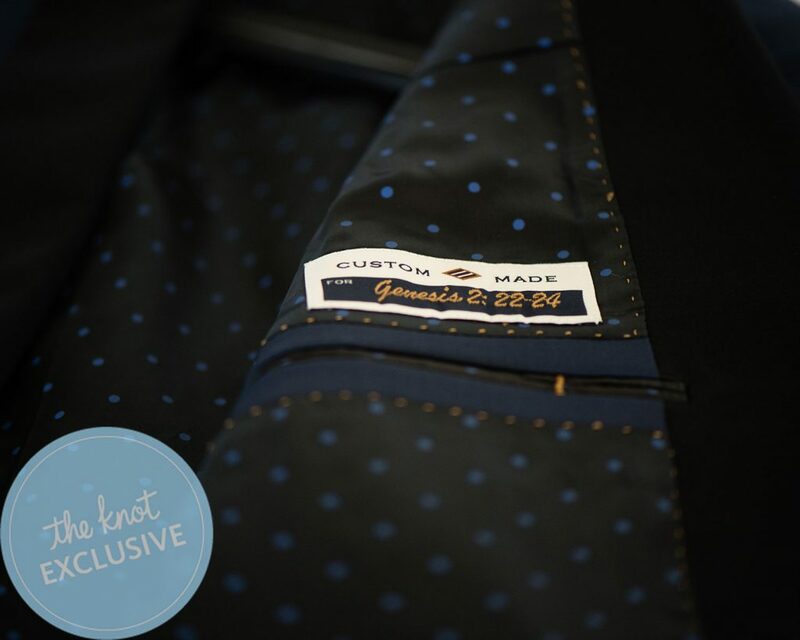 Bank, while the groom’s tux was customized by the company. 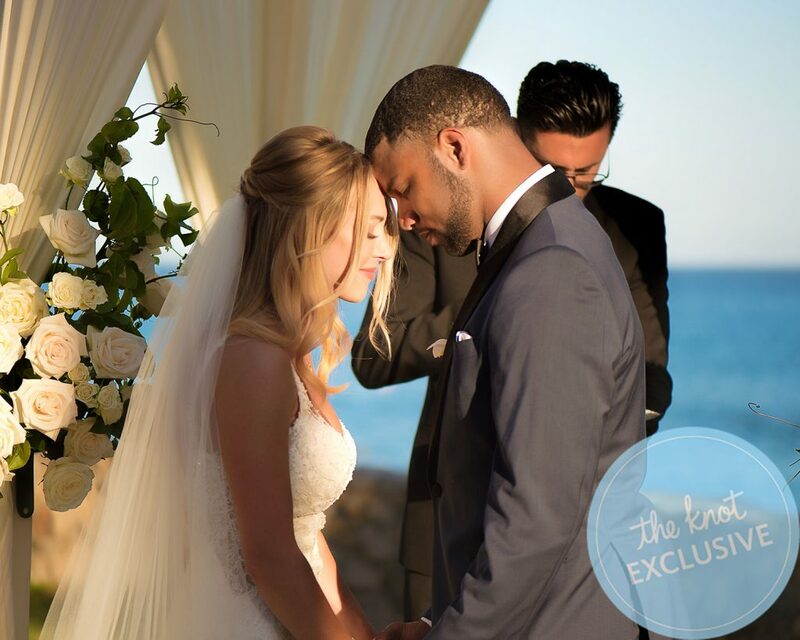 Two weeks before the wedding, Pollard’s grandfather passed away. 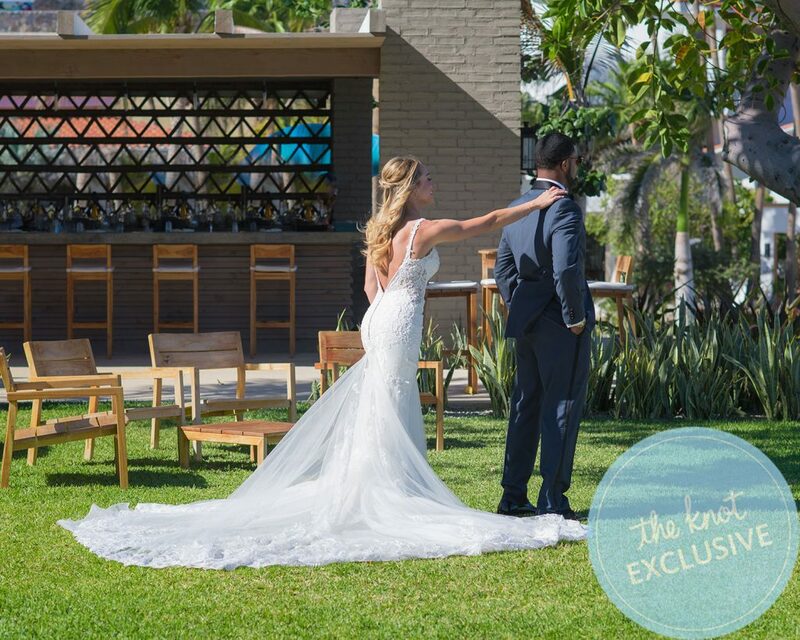 To honor her grandparents on both sides, the bride took pieces from her late grandmother Winifred Nokes’ 68-year-old wedding gown to bring meaning to both the ceremony and reception. Following the ceremony, guests enjoyed a cocktail hour and appetizers “We wanted to feed our guests at all times,” the couple shares. “A note to any future couples planning a wedding: Don’t start speeches until your guests have food and drinks in front of them! 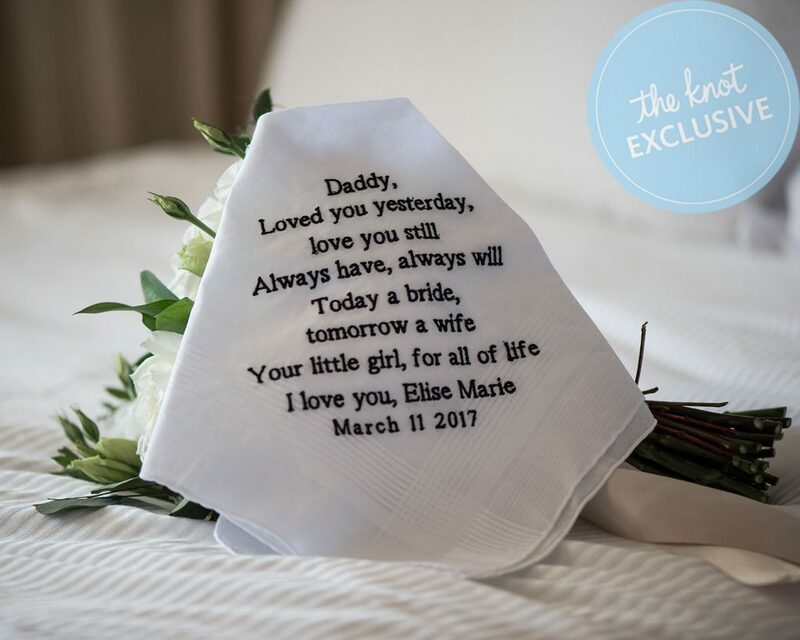 That was a big deal to us—to take care of our guests in that way.” The pair used customized coasters and napkins all from The Knot Shop, which were actually presented at every wedding party. Their cake was layered with different flavors—one carrot, one white cake, and finally, Funfetti to round it out. At the end of the night, guests enjoyed vodka popsicles—“People were freaking out over those!” Tate says—and the afterparty attendees enjoyed handmade burgers, fries, and the ultimate late-night snack: Mac and cheese. In retrospect, after an eventful weekend, the newlyweds conclude with some key advice for couples currently planning their weddings. 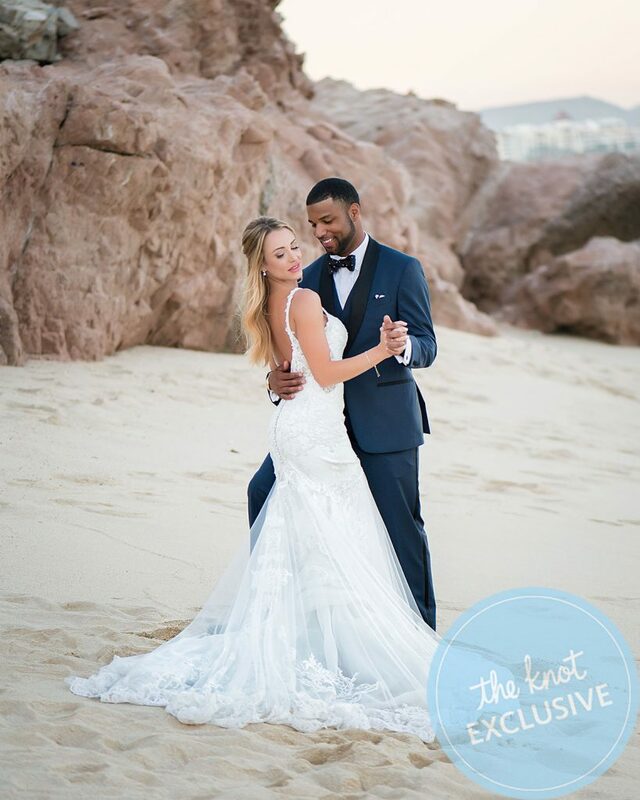 Be the first to comment on "NFL Player Golden Tate and Elise Pollard’s Wedding Album: Exclusive Photos, Details"